Before you plan a remodel for your kitchen, you need to keep in mind the fact that it can be a very demanding job. If you have already started with the work, then you make some of the changes as the work is going to proceed. 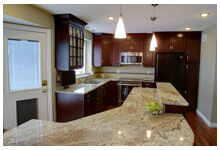 You have a choice to change the countertop using marble and granite. You can choose from the best marble Edmonton as there are many shops that will give you quite a lot of choices in the marble countertops. Before you get started with the work and select the countertop, you need to answer these questions that will ensure that the process is smooth and you don’t face much of the difficulties in the entire remodelling job. One of the very first things that you need to ask yourself is your need. After all it’s your kitchen and you need to decide, what works best for you and the things that you would love to have in your kitchen. For example, you might like granite countertop more, but you have to keep in mind the budget, so you also have an option of the marble countertops. You have to take all the things in to consideration, when planning the design that makes all the aspects work in right way. This is one thing that you need to plan a lot ahead. You must take aside a specific amount of money before you start the remodelling, so that all the work is done according the budget planned. There are lot of ways in which you can save in the kitchen countertops if you are going to search the market in a right manner. It is always advisable that you take the estimates for the granite and marble countertops from more than 4-5 places, as this will give you more opportunities to look for deals that match with your budget. Sometimes people want to remodel their house and they discover that what they want to do isn’t actually possible. There could be issues with the layout, the structural integrity or the electrics. Just a quick Google of ‘electrician near me‘ and someone can come out and look if it is actually possible. If you just want the countertop changed, then you don’t have to spend much on the entire remodelling. If you are going for a granite countertop, then it is best to leave everything in the hands of professionals as they guide you right from the installation to the sealing process. If you are option for the marble countertop, then you don’t have to spend extra getting it sealed. Before you start with the kitchen remodelling, take a look at the market and see if there are any offers on the countertops. It might be possible, that some shop owners might tell you that they are going to get very good countertops next month and they might give you good deals. This way, you can plan the time where you can many choices in the countertop options. Always make sure that you are calling in the professionals for the kitchen remodelling job. The countertops expert will give you the right guidance in selecting the perfect stone for the countertop and you can be sure of all the services and warranties for the years to come.